On the occasion of Ugadi: Hindu new year celebrated in Karnataka, Ranga Shankara is organizing Ranga Ugadi on March 22nd, Sunday. 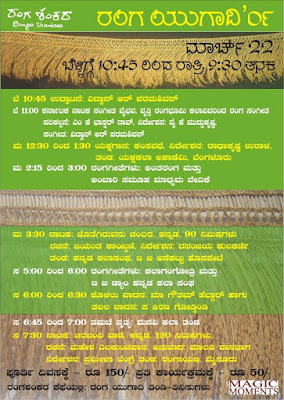 The events include: Yakshagana, music, stage drama.... The event starts from 10:45am in the morning to 9:30pm in the evening. Entrance ticket for the whole day is Rs 150 and for each event is Rs 50. Happy Ugadi!! :) Can't read Kannada so can't say much here! !